Dozens of former student journalists joined together on campus March 18 to celebrate the 50th anniversary of The Globe, Point Park's independently run student newspaper. 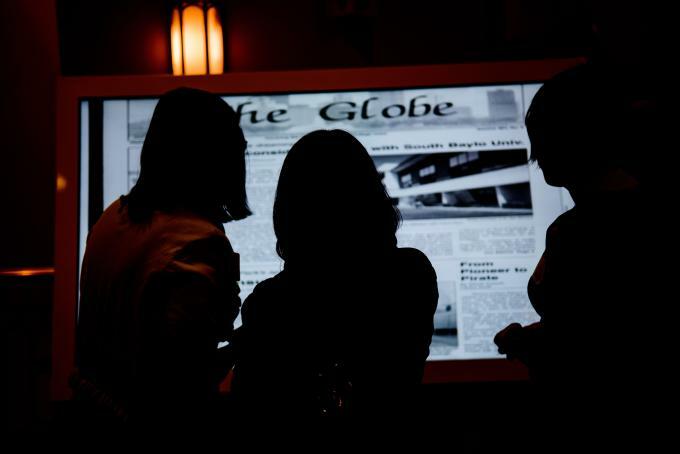 They shared memories and took a look back through the years at five decades of student newsgathering, opinion pieces, photography and more in The Globe. Susan Trulove (COM 1968), who served as the first editor of The Globe and was among those who returned to campus for the celebration, introduced the inaugural issue with the following words when it rolled off the presses in February 1967: "Our stage will be as large as our title, Globe, implies and as intimate as its namesake." According to Trulove, who went on to spend three decades as a science writer at Virginia Tech and is now retired and living in Virginia, her fondest memories included "sitting around in the basement (there was only one building), talking about the stories and doing the layout. [It was] a wonderful experience. We never had a problem with having enough to fill it. People seemed to like to write for it. The support of the student council was very much appreciated." Attendee and former reporter and assistant editor Taitia Shelow (Hager) (COM 1989) said, "[I remember] the camaraderie and late nights spent cutting and pasting and trying to come up with headlines of the right length, since this was back before the days when everything was digital. We'd be so punch-drunk tired by then we'd be laughing the whole time." Attendee Melissa Mezgec (Holovanisin) (COM 1997), who served as chief copy editor, lifestyles editor, advertising assistant, and writer, recalled, "working in The Globe office in the evenings after classes; ordering pizza at night and eating it in The Globe newsroom while cramming to get the publication out the next day; riding to the South Side with the editor-in-chief to drop off the final edition on CD for printing; and sifting through (hardcopy) newspapers of past years in 'the morgue.' Back then nothing was archived electronically - everything had to be pulled manually)." Many former Globe staffers who were unable to attend the celebration also shared memories, including Brooke Keane (COM '06), who served as copy editor, features editor, news editorand editor-in-chief. "Only one? Everything about being on The Globe staff was my favorite memory," she said. "Dancing on chairs, the chalkboard full of quotes, layout nights, signing my name to the wall on the inside of the closet, oh, and writing and editing too, of course." "The members of The Globe staff were my friends, my teachers, my family. I was, and remain, immensely proud of the work I did on The Globe. [It] was the best part of my time at Point Park and I'm so happy to help celebrate 50 years of quality journalism on Point Park's campus." The 2016-2017 staff of The Globe, including current editor-in-chief Alexander Popichak and editor emeritus Joshua Croup, saluted the 50th anniversary with a collection of features, including interviews with former editors and journalism faculty. Read the newspaper's 50th anniversary package. The support of the Point Park community is needed to establish a lasting legacy of The Globe's milestone. Together, the extended Globe family and generations of appreciative readers can create The Globe Legacy Scholarship, an endowed fund that will annually support the education of a deserving sophomore, junior or senior working at The Globe. Join Point Park in celebrating the last 50 years while, building a legacy for the next 50, by contacting Kristin Deluca, director of development and institutional partnerships, at kdeluca@pointpark.edu or 412-392-4777. Gifts of all sizes, from $10 to $1,000+, will help to establish a legacy for future generations of Globe staff.